Whether it’s nutritious food, a whimisical collar or a comfy bed, folks in the Show Me State want to provide the best for their finned, furred or feathered friends. The best place to get the kind of personalized service and specialty products for your pet is at a locally-owned shop. These are our favorite pet stores in Missouri. Since 2004, Pets in the City has worked to find natural answer for their customers’ questions and concerns about their pets. Located across Grand Blvd. from Compton Hill Reservoir Park, Pets in the City sells natural pet foods and treats, as well as toys, gear and accessories. In Kansas City, pets and their owners love to visit and explore Tail Waggin’ PetStop. The PetStop extends the Midwest’s well-known hospitality to KC’s animal citizens, creating a gathering place for pet lovers and their furry friends in the heart of the Crossroads Arts District. Pets and people in Springfield go out of their way to visit Fetch Pet Supplies. Along with a wide selection of pet foods, toys and accessories, Fetch also offers a self-service dog wash facility, as well as house-made pet treats that are sure to make tails wag. Another awesome locally-owned option for pet food and supplies in St. Louis is Pawsitively Fintastic. They are a community-oriented pet boutique that also offers toys, accessories and services for your furry and finned friends. Among their services are bathing and teeth cleaning. No matter what kind of pet you own or are looking for, you are likely to find what you need at Pet Topia in Kansas City. They sell accessories, food and supply for dogs and cats to fish (freshwater and saltwater) and exotics—as well as everything in between. Now with three locations in the greater Columbia area, Lizzi and Rocco’s Natural Pet Market is a local favorite among pet lovers. The store sells products that focus on your pet’s health and nutrition. From high-quality and natural food and treats to advice and products to foster interactive play, the folks at Lizzi and Rocco’s strive to help your pet thrive. If you’re an exotic pets person, CJ’s is the place for you. A huge selection of tropical, fresh and saltwater fish, along with reptiles, aquariums, filters, pumps and supplies, makes this shop the premier destination for fish and exotic pet lovers in the capital city. Pet owners in St. Louis who are concerned for their pets’ health and nutrition appreciate the huge selection of natural pet foods at Four Muddy Paws. In addition to food, treats and accessories, Four Muddy Paws also offers self-service dog dog washes and professional grooming at their two locations. 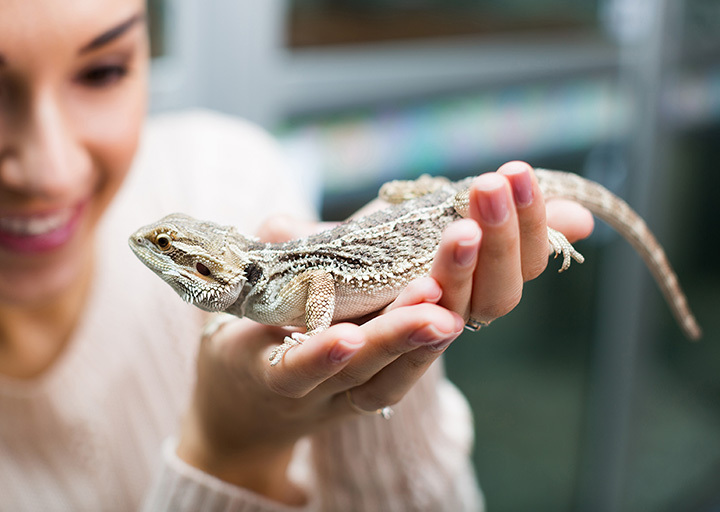 Exotic pet lovers in Kansas City can find the pets they want, along with the food, accessories, toys and supplies they need at Miles of Exotics. Miles of Exotics carries birds, freshwater and saltwater fish—including tropical species—and reptiles. Cat and dog lovers will also find the supplies they need, as well. Columbia Pet Center—in Columbia, of course—specializes in tropical fish, birds, reptiles and small animals, like hamsters and chinchillas. In addition to the equipment and accessories that you’ll need for the pets they carry, Columbia Pet Center also sells food and merchandise for dogs and cats.